is the founder of the Azeemia Sufi Order. ‘Hasan Ukhra‘ is the Title granted by the Prophet Mohammed (SAW). ‘Mohammed Azeem‘ is the name given by his parents. The Azeemia Spiritual Order or Silsila-e-Azeemia is named after him. ‘Burkhiya‘ is the pen name, which he used as a poet. ‘Qalander Baba Auliya’ is the alias with which most of the people are familiar. The terrestrial and celestial angels know and address him using this title. During his stay in Aligarh, Qalander Baba Auliya became inclined towards learning spirituality. He spent a lot of time at the tomb of the Sufi Maulana Kabuli. It was in those times, when he went to visit his maternal grand father, Tajuddin Baba Auliya Nagpuri. Teacher of the teachers, Knower of Divine Secrets, Baba Tajuddin instructed his grand son to stay with him in Nagpur for Spiritual training. Upon learning his son’s intention to learn spiritual knowledge, Qalander Baba’s father came to Nagpur to persuade his son to complete his academic education. Baba Tajuddin replied to his father that if he would receive academic education any more, he would not be useful to him. His father left his son to his own liking. Qalander Baba’s mother died leaving six children; one sister was older and all others were younger to him. Tajuddin Baba advised him to get married. He married the daughter of one of the followers of Tajuddin Baba Auliya in Delhi. In 1947, during the partition of India and Pakistan, Qalander Baba Auliya migrated to Karachi in Pakistan with his father, siblings and his family. He rented an old house near Lee Market. The Commissioner for Rehabilitation, who was also one of the followers of Tajuddin Baba, requested him to lodge an application with him so that he could be allocate a house to him. He did not take any notice of his suggestion and continued to reside in a rented premise. In 1956, the then Master of the Sohrwardi Order, Hazrat Abul Faiz Qalander Ali Sohrwardi visited Karachi. Qalander Baba Auliya went for an audience with him and requested to be initiated. Hazrat Abul Faiz asked him to come at 3 O’ clock in the morning. In the bitter cold of the early morning, he sat on the steps of the Grand Hotel on McLeod Road, Karachi; exactly at 3 O’ clock Hazrat Abul Faiz opened the door and asked him to come inside. He instructed Qalander Baba to sit in front of him and then he blew on Qalander Baba’s forehead 3 times. With the first breath the realm of spirits was revealed. With the second blowing of the breath, angels and the Divine Attributes was revealed and with the third breath the highest realm was revealed to him. Hazrat Abul Faiz Qalandar Ali Soharwardi imparted spiritual training to him in three weeks time. After that, Qalander Baba’s spiritual training was taken over by the soul of Sheikh Najmuddin Kubra. When the training was completed He transferred the spiritual knowledge to him and presented him to the Divine Presence of God. 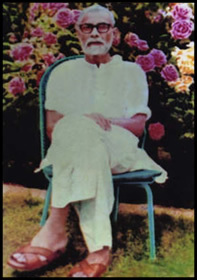 Possessor of Insinuated Knowledge, knower of the secrets of the Command ‘Be’ and its implementations, Proclaimer of reality, His Divine Grace Qalander Baba Auliya was a man of signs and wonders but by nature he was a very cautious person and avoided performance of wonder-workings (karamat). But despite his careful attitude many wonder working took place by him. Khwaja Shamsuddin Azeemi wrote these wonder-workings in his book “Tazkara Qalander Baba Auliya (R.U.A)”. I feeling grieved even more, said, “I am at loss to understand that how a cat could dare to prey on my pigeon in your presence,” I was quite desperate, I went to the kitchen with a heavy heart. His divine Grace, Qalander Baba Auliya called out my name twice. Grief and anger had made me arrogant and I ignored his calls. When I came out of the kitchen, I saw my pigeon pecking in the compound. I couldn’t believe my eyes. I ran upstairs and found feathers and blood spots on the roof. I felt ashamed of myself. Came down and fell on the feet of His Divine Grace and apologized for my indecorous behavior. Before evening I distributed all the pigeons to my friends and decided to stay away from the hobby.